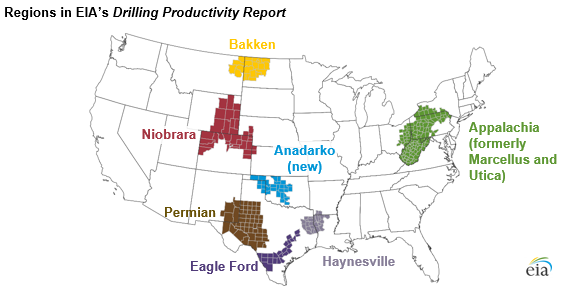 To provide more complete coverage of U.S. crude oil and natural gas production, EIA is expanding the Drilling Productivity Report (DPR) to cover the Anadarko region, which covers most of the production from the Anadarko Basin in 24 counties in Oklahoma and 5 counties in Texas. Two other regions—the Marcellus and the Utica—have been combined into one Appalachia region. The Anadarko Basin has a long history of hydrocarbon production and, in recent years, has seen an increase in activity mainly from two areas commonly known as the STACK (Sooner Trend Anadarko Canadian and Kingfisher) and the SCOOP (South Central Oklahoma Oil Province) plays. Prior to including the Anadarko, the DPR reported on 73% of all active onshore rigs in the United States: 680 of the 928 onshore rigs nationwide as of July 2017. Including the 129 active rigs in the Anadarko region will increase the report’s coverage to 87% of all active U.S. onshore rigs. The Anadarko region accounts for approximately 450,000 barrels per day of oil production, 5.7 billion cubic feet per day of natural gas production, 13% of new wells drilled, and 13% of drilled but uncompleted wells as of July 2017. Production in the Anadarko region mainly comes from shale and limestone layers of the Meramec, Osage, and Woodford formations. These formations are deep but offer thick layers of shales—thicker than those in the Bakken formation and similar to those in the Eagle Ford formation. Other producing formations in the region include the Granite Wash, Cleveland, Tonkawa, and Marmaton, which are mainly located in Texas. The most prolific counties to date, however, are in Oklahoma. In addition to adding the Anadarko region to the most recent report, EIA is combining the Marcellus and Utica regions into one Appalachia region. The formations of the Appalachian Basin that make up the Marcellus and Utica plays span New York, Ohio, Pennsylvania, and West Virginia and overlap in some areas. As drilling activity and production in the Appalachia region have increased in recent years, the overlapping formations make it difficult to attribute production to the proper formation. Combining the two regions into the Appalachia region better reflects the underlying geology of these formations.